(CAMBRIDGE, MA) — Researchers from MIT are taking their microbial research out of the lab and into the kitchen. Their new Herman Project modernizes a longstanding tradition, with a digital network that tracks the evolution of sourdough starters as they are shared by home bakers around the world. By crowdsourcing information from the project's participants, the researchers, based in the Department of Civil and Environmental Engineering (CEE), are investigating how the starters' microbial communities change in different conditions and environments. Sourdough starters — a mixture of flour and water that, through the growth of bacteria, is responsible for the unique taste of sourdough bread — have traditionally been shared among friends and families. The starters, known affectionately as "Herman," are typically shared with paper instructions for "feeding" the sourdough starter, and an accompanying letter to track the sourdough starter's path as it is passed from person to person. "The Herman Project isn't just doing citizen science and asking people to help us gather data. We're giving people the opportunity to participate in the scientific process," Leventhal says. "We plan to have feedback with the data that's generated from the [sourdough] samples, where we can share the data and the genetic makeup of a starter, so participants can see how the starter changes over time, and potentially also do little experiments at home with their starters." 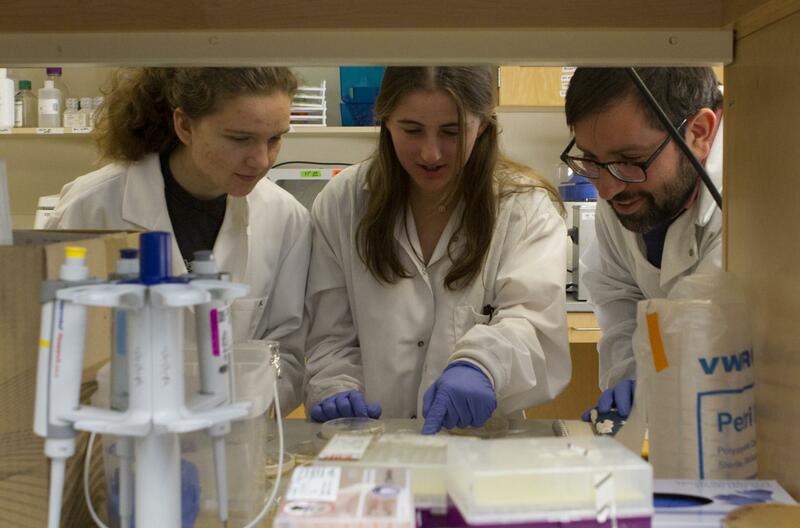 To help kick-start the project, Cordero and Leventhal hosted two first-year students, Weidman and McAllister, in their lab over MIT's Independent Activities Period as part of CEE's mini-Undergraduate Research Opportunities Program (UROP). Weidman and McAllister fine-tuned the instructions for participants, designed an accessible online platform, tested The Herman Project in its beta phase, and conducted online research for The Herman Project website. "My primary part was working on the instructions, and we wanted to make it more visual and look as easy as possible," McAllister says. "We tried to make it very simple and easy to follow. I learned graphic design tools and made a big wheel that we later ended up animating to make it more interactive and highlight where in the wheel you were. Then at the end, it gave you a way to find out what our next steps would be." Meanwhile, Weidman translated the complex, scientific details of sourdough into more understandable blurbs for the website. "I really liked how we were able to take what we were learning and present it to the community," she says. The Herman Project works by giving each sample of "Herman," the sourdough starter, an identification number, and using an online platform to instruct users for how to feed Herman. Herman needs to be fed with additional flour and water over four days to acclimatize to its new kitchen environment and to let the mixture ferment. Herman is then ready to be mixed with baking ingredients and cooked. Not all of the starter is used, however, and participants save some of Herman to use for future baking. As Herman is passed between friends, the new participants also log information on The Herman Project website, noting their location and type of flour used while growing their new starter. Each user thus adds data for the researchers to study and expand the network. In addition to participants logging their approximate location and environmental conditions of Herman as it is fed, they are also asked to share a sample of Herman with Cordero's lab. The researchers, assisted by Weidman and McAllister, will isolate the microbes and study how the microbial communities differ across time and environments. The project's network is currently centralized in the greater Boston area, as members of Cordero's lab begin to share Herman with their peers. "The Herman Project allows us to study microbial evolution in the context of communities, where multiple species coexist and interact," Cordero explains. "This is one of the frontiers in our field. I found it really elegant and exciting that we can take advantage of the social dynamics around sourdough to 'crowdsource' an evolution experiment through the Herman Project." "I think The Herman Project could help us address many important questions," Cordero says. "For instance, what is the impact of strain-level (within-species) diversity with respect to stability and function, are there alternative trajectories for evolution, and if so, what controls them? These are important questions to address if we want to learn how to control and design microbial consortia." "Microbial communities have been used as biotechnology by human societies for millennia. A key difference between using microbes as engineering tools and inert components, however, is that "microbes are 'alive' — they grow, they get mutations, and they evolve. We need to understand how this influences their function as a community if we want to use them sustainably," Leventhal says. Under Leventhal's guidance, Weidman and McAllister are planning to conduct analyses of the bacteria and yeast genomes to get a complete understanding of the microbial community of each sample as part of their UROP. "The Herman Project is a really cool way to take something that a lot of people know about, and to investigate what's actually happening," McAllister says.